Robert Koch - Inventor of The Method for Purifying Antaceptic Bacillus. 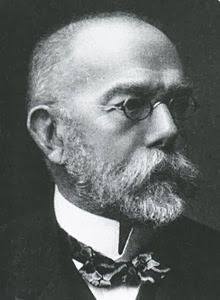 Robert Heinrich Herman Koch is considered the founder of modern bacteriology, known for his role in identifying specific TB, cholera, and anthrax causal agents and to provide experimental support for the concept of infectious diseases. Robert Koch was born in Clausthal, Hanover Kingdom, Germany, December 11, 1843 and died in Karlsruhe, Grand Duchy of Baden, May 27, 1910 at the age of sixty-six. Robert Koch was born on December 11, 1843 in Clausthal-Zellerfeld, Hannover, Germany under the name Robert Heinrich Hermann Koch. His father was a leading mining expert. Koch attended elementary school at a local school located not far from his residence. Upon entering high school, Koch showed a very high interest in biology. In the biography of Robert Koch in a publication entitled Nobel Lectures, Physiology or Medicine 1901-1921 explained Koch studied medicine at the University of Gottingen in 1862. Later, in this place Koch knew a professor of anatomy, Jacob Henle. The introduction seems to be a historical experience for Koch. Jacob Henle was the first to influence Koch to study bacteriology. It was felt by Koch when he learned Henle's opinion that infectious diseases are caused by living parasitic organisms. After that, Koch graduated and got a MD (medical doctor) in 1866. Koch later married Emmy Fraats who gave him a child named Gertrud. Research Research Robert kochagainst anthrax begins when anthrax becomes the most prevalent animal disease of the day. Armed with a simple microscope in the laboratory in his home room, Koch tries to prove scientifically about the bacillus that causes anthrax. This is done by injecting Bacillus anthracis into the bodies of a number of mice. Koch got Bacillus anthracis from the spleen of livestock that died from anthrax. As a result, all mice that had been injected by Bacillus anthracis were found dead. Meanwhile, mice injected by blood originating from the spleen of healthy animals were found alive. Through this experiment, Koch reinforces the results of another scientist's research which states, the disease can be transmitted through blood from animals that suffer from anthrax. After successfully performing his first experiment, Koch's curiosity towards anthrax got bigger. Casimir Davaine is a scientist who proves Bacillus anthracis direct transmission among several cows. However, Koch wants to know whether Bacillus anthracis that has never been in contact with any animal species can cause disease. To answer that question, Koch discovered a method of purifying bacillus from a sample of blood and then bred. Through the method Koch is able to identify, study, and take pictures bacillus being bred. Thereafter it can be concluded that if Bacillus anthracis is in an unfavorable environment outside the host, the bacteria will produce spores to fight against an environment that is unsuitable for them. Conditions like this can last for a very long time. When the environmental conditions have returned to fit and normal, the spores will trigger the re-development of bacillus. If the spore is embedded in the soil, it will cause spontaneous outbreak spreading. From his second experiment, Koch concluded, although bacillus is not in contact with any animal species, they can still cause anthrax. The findings were demonstrated by Koch in the presence of two professors named Ferdinand Cohn and Cohnheim. The two professors were very impressed with Koch's discovery. In 1876 Ferdinand Cohn published Koch's discovery in a journal. Not long after that, Koch became quite famous and himself was awarded a job at the Imperial Health Office in 1880 in Berlin. Popularity and appreciation did not make Koch quickly complacent. At his new workshop Koch got a better laboratory facility than before. Koch then discovered methods of planting bacterial cultures in solid media such as potatoes. Koch also developed a new method in identifying bacteria with dye (staining) to be more easily visible. Various methods found by Koch can make pathogenic bacteria more easily obtained in pure culture (pure culture). Whereas previously, pathogenic bacteria are very difficult to find because mixed with other organisms that can be identified. For that reason, Koch provides the formulation of a number of conditions that must be met before bacteria are considered the cause of the disease. The formula is known as Koch's Postulates (Koch's Postulates). Found in all cases of the disease that has been examined. It has been processed and maintained in pure culture (pure culture). Able to make a genuine infection (infection infection), although already several generations are in culture. Recoverable from inoculated and re-cultured animals. Koch's research is not limited to anthrax. Other diseases such as tuberculosis and cholera are also studied by Koch. In 1883, Koch was sent to Egypt as head of the German Cholera Commission to investigate the spread of cholera in the country. Although Koch has not proven it in various experiments, Koch can identify bacteria called Vibrio bacterium as the cause of cholera. Koch was appointed professor of health sciences at the University of Berlin in 1885. In addition, Koch was awarded an honorary professor in medical school and served as chair of the Institute for Infections for Infectious Diseases. Koch has traveled to various parts of the world to learn about various diseases, including Java. In 1905, Koch was awarded the Nobel Prize in physiology or medicine. Koch devoted almost his entire life in the field of bacteriology which is useful in studying various diseases. Koch suffered a heart attack on April 9, 1910 and never made a complete recovery. On May 27, 1910, just three days after giving a lecture on tuberculosis research at the Berlin Academy of Sciences, Robert Koch died in Baden Baden at the age of 66 years. Koch is remembered as one of the founders of the field of bacteriology. After his death, an Institute with his name was established in his honor. 0 Response to "Robert Koch - Inventor of The Method for Purifying Antaceptic Bacillus"